Proposed by shyxsakura and highlighted by OracleAngel. the thing that caught my eye is the light pastels you have working in the wall. the grass edging near the fence is also very nice. Aww, very cute! The background is awesome, everything looks perfect! And the scan rocks, it's wonderfully extracted! Exellent job! Haha.. keep up the good work! *ahem* Anyway. Totally loving the pastel look of it. The rainbow was an excellent touch, but my favorite part has to be the foliage, mainly the pink flowers. You're gonna have to teach me how you do that. It looks fantastic. nice wall here..looks like some canvas painting..
Everything is very harmonic and fresh in your wallie. Congrats for this delicate piece of art! What a nice and soft wallpaper! Fell for it right away when I saw it. 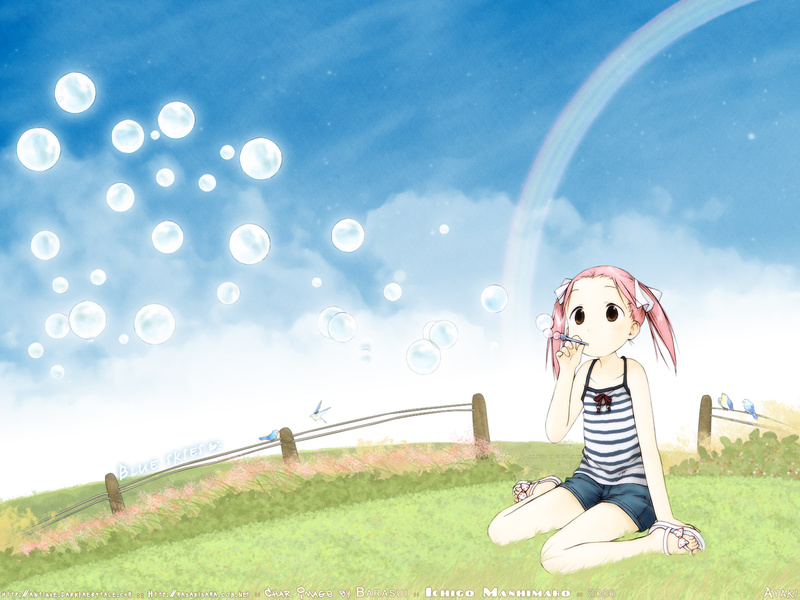 This is such a cute wallpaper ^^ Its so simple yet nice, and its really attractive. Looking at it makes you want to smile =)lovely job on it! aww! <3 It's so cute! XD I love what you did with the original image and everything looks drawn ^^ Wonderful!